HOT DEALS: Leap year one-day sale on Play.com | What Hi-Fi? In case you hadn't noticed, it's a leap year and to celebrate the fact Play.com is running a one-day sale today, February 29th. 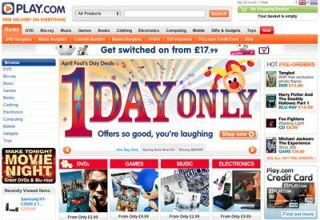 There are discounts on DVDs, Blu-rays, CDs, games, tablets, iPod docks and headphones until midnight tonight. Deals we've spotted include a Disgo 7000 Slim 7in Android tablet for £49.99, Sandisk Sansa Clip+ (8GB) MP3 player at £29.99, Limit IP-CR100 iPod dock for £14.99 and the Ultimate Bourne Blu-ray collection £12.99. Oh, and a pair of Skullcandy Lowrider headphones for £14.99.